Aurora Hills Farm and Nursery, Inc is a family business started by Tom Howe in 1970. Previously, Tom worked for nine years with his father, Frank Howe, at Clarendon Gardens in Pinehurst. Tom’s two sons, Tommy and John, have been with the landscape and nursery business full time since the early 1980′s. This experience and consistency within the business enable us to serve you in a superior manner. Aurora Hills Landscaping, Tommy Howe (910-695-8551) , provides a wide range of landscape services. There is no cost or obligation for an initial visit and inspection. A Registered Landscape Contractor will visit the site, upon request, and discuss your landscape needs. We recommend that water erosion control be the first topic discussed. 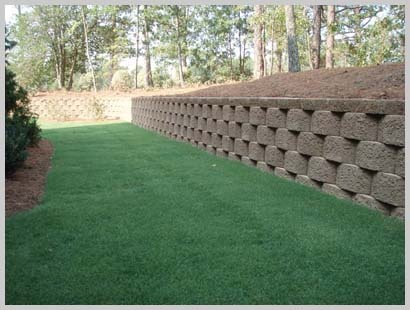 Second, we should discuss any hardscaping needs; such as driveways, retaining walls and bulkheads. Next, planting and irrigation will be discussed. We recommend that the homeowner visit the nursery to inspect and choose landscape material. At this point a landscape design will be drawn to your specifications using the landscape contractor’s expertise. Aurora Hills will make any necessary changes in the plan during the planning phase. Our fleet of landscaping equipment includes one of the largest tree spades in the Sandhills, which is capable of relocating existing trees before construction begins. Other equipment; dump trucks, back hoe, ditch digger, front end loaders and a variety of tractors for any landscape need. This equipment can save the homeowner money by eliminating sub-contract fees. Aurora Hills Nursery has 100 acres of container and field grown landscape material in production. This means the plants are well acclimated to the sandy soil of this area, and because we grow our own plants we can offer savings to our customers. Look for our maintenance schedule coming soon to this Web site.